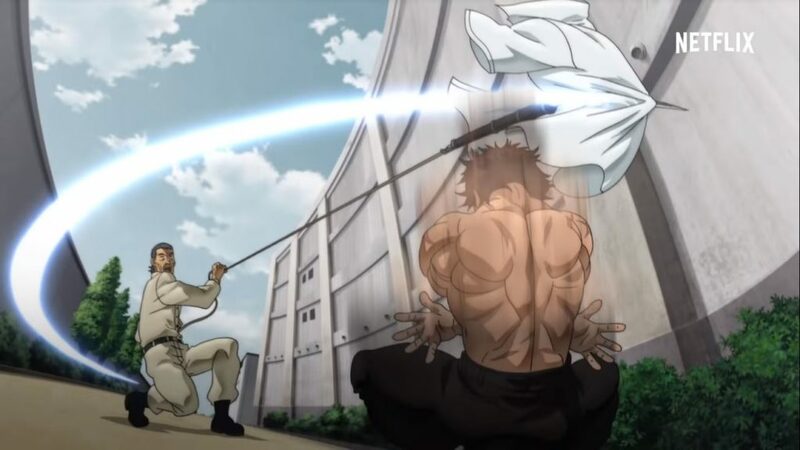 BAKI, one of the newest anime to make its way to Netflix, sits in a rather unique and confusing place among the many anime the service has to offer. It is the newest adaption of the nearly thirty year ongoing, martial arts-focused, Baki the Grappler manga series by Keisuke Itagaki. Though you would be wrong to think that this new series is a reboot. BAKI is actually the third adaption of the character’s story and it chronologically takes place after the first two adaptations, essentially making it Season 3. The first adaption, Baki the Grappler, was 24 episodes and released in 2001. Later that year, the second adaption, Grappler Baki: Maximum Tournament, adapted the titular Maximum Tournament arc. 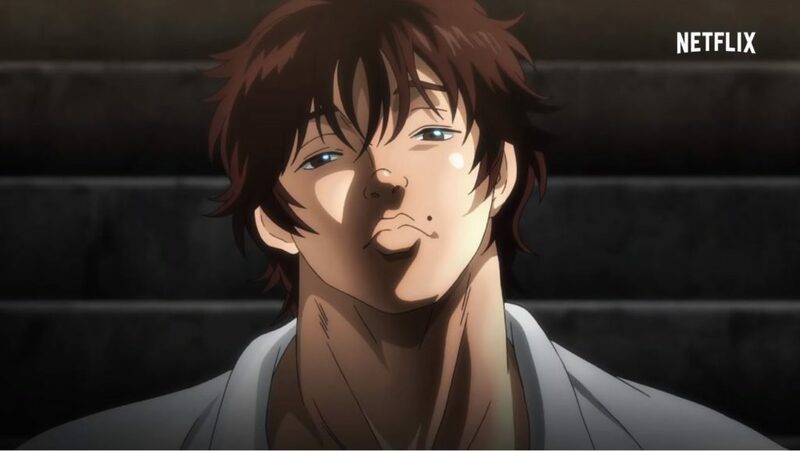 To add to the confusion, Netflix has only screened the first half of BAKI, releasing 13 episodes so far, with the second half now set to be released on the 30th of April. 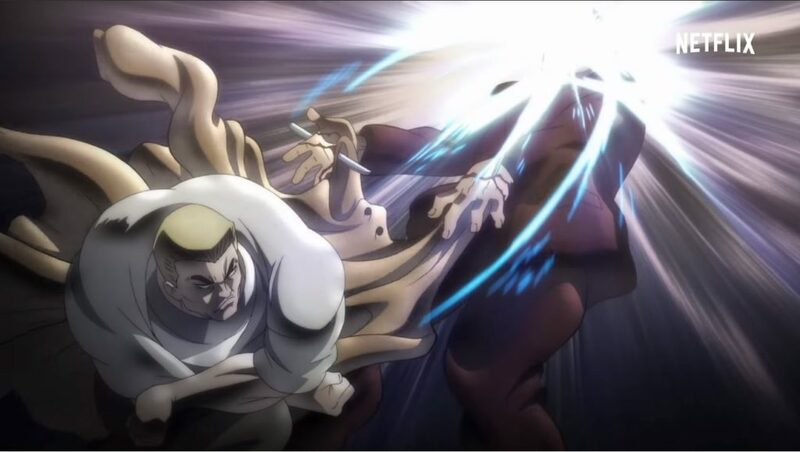 So with the anime (and Netflix) timeline of BAKI now slightly less confusing (hopefully), let’s see how the first part of this new ultra violent, muscle-popping saga has fleshed out. The overarching story follows Baki Hanma as he trains to surpass his father, Yujiro Hanma, currently known as the strongest fighter in the world. 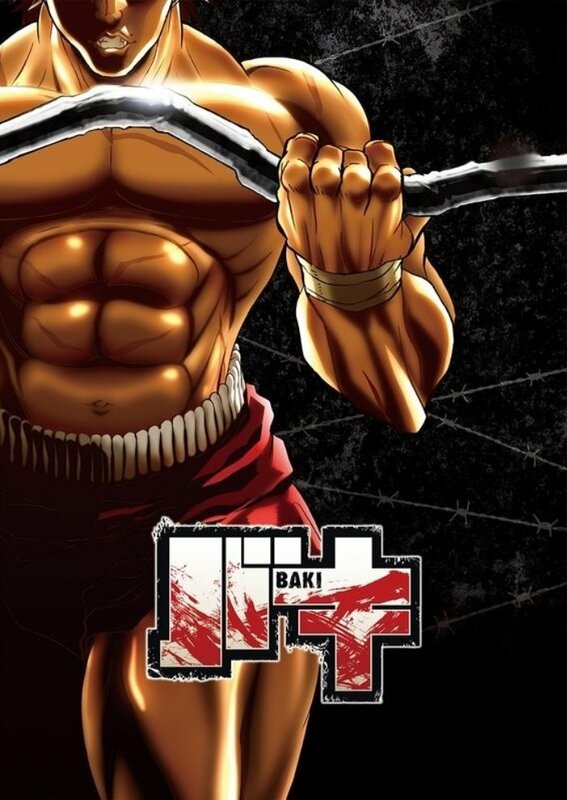 Having won the recent underground arena tournament, Baki has now established himself as one of the world’s most elite fighters, even though he is young enough to still be attending high school. Unbeknownst to him, a far more deadly challenge now awaits in the form of five of the world’s most violent and deadly death row inmates who have come together in Japan to face Baki with one goal in mind: to finally taste defeat. Hearing of Baki’s reputation, they believe he could be the one to finally beat them. 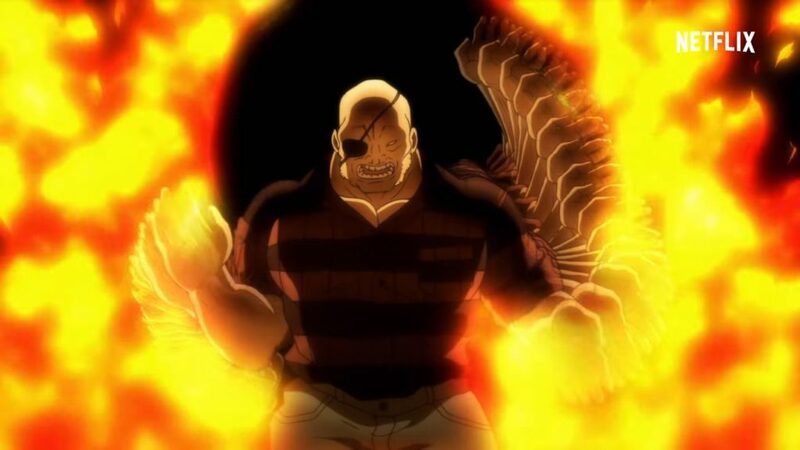 He does not face them alone, however, as he is joined by fellow fighters: Kaoru Hanayama, Gouki Shibukawa, Retsu Kaioh, and Doppo Orochi as they look to survive and defeat the attacking inmates. If you haven’t already realised from that brief summary, the story is bonkers, particularly for this “Most Evil Death Row Convicts” arc. 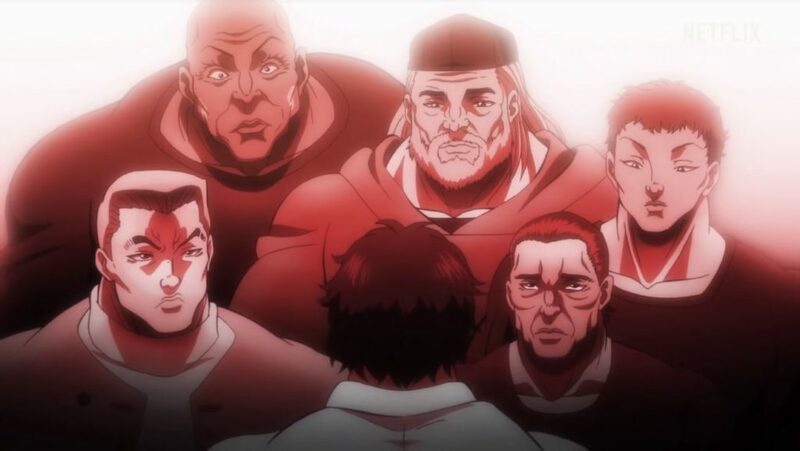 The opening of the series sees five unrelated inmates, all about to receive the death sentence, only for them to all escape or even inexplicably survive and simultaneously make their way to Japan to find Baki. Some of them even swim across the ocean to do so. The story is ridiculous, absurd and has no right to be as enjoyable as it is at times. At some points it feels like an inversion of JoJo’s Bizarre Adventure where in the place of flamboyant camp it has overwhelming machismo with ninety-nine percent of problems being solvable if you have the sheer muscle mass to deal with it. I’m not even joking: a character’s ability to defeat something, even death, seems to be entirely dependent on how much muscle they have. With the main cast all looking like water balloons wrapped in an abundance of thread on the verge of popping, they prove that they can survive anything from gunshots, explosions, and even electrocution. At this point it seems like nothing will stop these fighters short of an atomic bomb, but we will have to wait and see as maybe this will be attempted in the series’ second half. The draw of BAKI is not really in its often nonsensical story, but in the fights themselves. It’s in these fights that we learn of the structure the show often takes. Two fighters will face off and as a new ability or technique is displayed, we are presented with a narrated aside to explain this. These can range from simply explaining how the ability is executed all the way to a ridiculous historical event that somehow relates to these two fighters punching each other in a car park. There is not a great deal of genuine emotion or nuance to these fights, but they do become a bit of a guilty pleasure, a fight of particular note being between the convict, Speck, and Yakuza leader, Kaoru Hanayama. It continues on for a ridiculous amount of time and every time you think it’s over, there is another absurd aside for the narrator to explain why the fight is far from over. Over 26 episodes, this could become tiresome, but in this first half they still have some novelty. As someone who has watched combat sports for years, the martial arts aspect of the series and how it would be portrayed was one of the most intriguing aspects to me. A show that is essentially based around confrontations between different martial arts practitioners has a lot of potential for stylistic clashes, and incredible fights, if the richly (sometimes grossly) detailed manga is anything to go by. Unfortunately, the translation from the manga has not been particularly smooth. The characters all look ridiculously muscular and detailed as adapted for the series by the studios TMS Entertainment (also responsible for the Baki OVA released in 2016) and Double Eagle, but these hulking masses of muscle don’t work as well in motion. In fact there is very little fluidity in the animation of the fights, often being represented as a collection of still frames showing the momentous points of impact or, when more movement is required, some really uncomfortable-looking CG animation. It is just unfortunate that in a series where the fights are the focal point, the animation cannot really convey the action properly. The voice acting across both the Japanese and English dubs is pretty solid, with the cast generally portraying many intimidating and often twisted fighters. The exception, at least in this first part, is Baki himself. He is essentially a background character in his own series with several episodes not even having him present. The episodes where he does have a prominent role, he comes across as stoic and gormless, often being outsmarted by his opponents. As a result, the voice acting by Nobunaga Shimazaki and Troy Baker is fairly minimal and dry. This isn’t a criticism of the actors themselves as Shimazaki has shown his talent across many anime and Baker is an accomplished voice actor in games with incredible performances such as Joel in The Last of Us. They are just not afforded the time or the script to really showcase their ability. The narrator is probably the most important role in the whole series being voiced by Toru Furuya and Kirk Thornton. I emphasise this because he has by far the most dialogue and holds the whole story together. He provides exposition for the characters’ origins, previous events, and the show’s many bizarre asides. The narrator essentially ties together and attempts to rationalise the insane events of BAKI and both actors do a great job with their stern performances. Beastful by Granrodeo is the series’ opening for this first part and it is everything you would expect going into a hyper-violent series such as this. It is a furiously paced metal track with the visuals showcasing the series’ many musclebound characters throwing punches and kicks with splashes of blood and wind shear exploding across the screen. It fits the show like a glove, demonstrating what is in store without trying to sugarcoat the gruesome violence that is in store. The closing theme, Resolve, performed by Azusa Tadokoro (lyrics by Miho Karasawa) is just as intense as the opening, immediately hitting you in the face with guitar solos, followed by Tadokoro’s powerful vocals. It is safe to say that this series is not following the common trend in anime of winding down each episode with a more calming theme. Then again, BAKI is an intense series ,so it feels appropriate to bookend each episode with songs of this nature. We still have another month to wait (at the time of writing) until the second half of BAKI is released on Netflix and it is unfortunate that the first half ends so abruptly. The absurd, violence-driven plot may not be to to the taste of many, but if you don’t take it too seriously it can be really enjoyable. It is just unfortunate that the animation and the characterisation of Baki himself has so far been lacking as that could really have pushed the series up a notch. I will give the second half a chance when it is released on April 30th and possibly renew my gym membership in the meantime so I don’t feel so bad watching the second part.